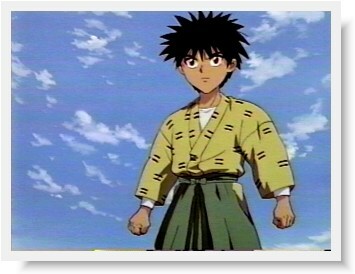 Enter Yahiko, to be Kaoru's new pupil at the dojo and a rather annoying kid to boot too. To date, the anime follows the original manga quite closely. Generally the animation quality in this series has been pretty typical TV quality level animation although the music has been fairly decent. Again there is generous use of comic relief which may wear a bit thin after awhile. Otherwise, the voice actors seem to have settled into their roles quite well. The story to date has concentrated both on introducing characters and maintaining a good pace of action to keep most people interested. Also, we get a bit of character development on both Kenshin and Kaoru's parts as we find that they simply can't leave the poor child thief to fend for himself and instead needs step in to his aid. More importantly, we find that Kenshin seems to be quite gentle in spirit despite being a near super-human fighter who killed so many people in the past.